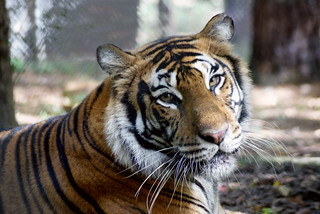 Tours at Carolina Tiger Rescue are all pre-arranged. We cannot accommodate walk-in visitors. You may choose from one of our regularly scheduled daytime public tours, an early evening twilight tour, or make an advance reservation for a private tour. Each tour is guided and you will be walking the gravel tour path. There are several things we want you to know about before you book your visit to Carolina Tiger Rescue. Please read the information below before purchasing tickets.